Nine years ago, Philanthropy Ohio and the Council of Michigan Foundations started a new capacity-building initiative, with four other participating regional philanthropy-serving organizations (PSOs), to prepare regional PSOs for individual, collaborative and collective policy work at the local, state and federal levels. 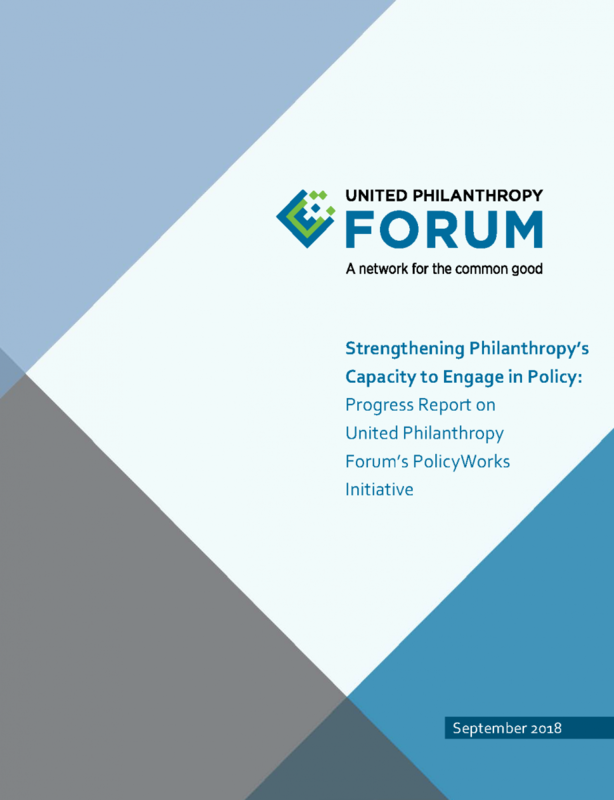 They managed the initiative, called PolicyWorks for Philanthropy, through three years of growing success, after which it was managed by United Philanthropy Forum (then called the Forum of Regional Associations of Grantmakers). Through PolicyWorks, the Forum provides its regional PSO members (and now increasingly its national PSO members) with a wide range of support, including peer learning and sharing, policy-focused webinars, an annual PolicyWorks Institute, an annual policy capacity assessment and profile, and much more. This report highlights key areas of progress for PolicyWorks during its first nine years, based on the responses of 32 regional PSOs. It documents some dramatic gains in regional PSOs’ capacity to engage in government relations, advocacy and public policy work, and the critical role that the Forum has played indirectly supporting this growth. The share of regional PSOs allocating some staff time to focus on policy work (either part-time or full-time) increased from 45% in 2009 to 84% in 2017. Less than a quarter of regional PSOs (21%) provided educational briefings directly to policymakers about timely public policy issues in 2009, but 68% reported doing this in 2017. Most regional PSOs (83%) said they improved their understanding of current trends related to policy issues in 2017, and 96% of these PSOs reported that the activities and resources provided by the Forum directly (68%) or indirectly (28%) supported this change. Nearly all regional PSOs (94%) increased the flow of policy information to their members last year, with 82% of these PSOs reporting that this was supported by the Forum either directly (50%) or indirectly (32%). Nearly three-quarters of regional PSOs (71%) conducted education and outreach activities with their members in 2017 to raise awareness about how and why grantmakers should help to ensure an accurate census count, and 96% of these PSOs said the Forum supported these efforts directly (68%) or indirectly (28%). The share of regional PSOs reporting that their staff had the right mix of skills and expertise to achieve the current policy work objectives increased from 45% in 2016 to 56% in 2017. Similarly, more PSOs reported that the allocation of staff time for policy work is clear and adequate to achieve their policy work objectives, from 29% in 2016 to 44% in 2017. About a third (35%) reported that adequate budget was assigned to support the achievement of current policy work objectives and that the performance against the budget is regularly monitored, up from 23% in 2016.